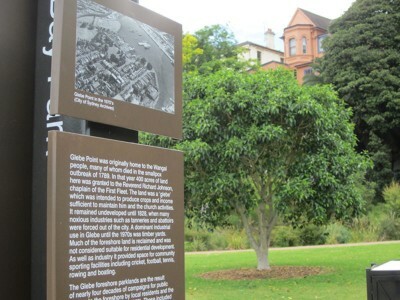 This sign commemorates the Glebe Society campaign to achieve public access to the foreshore. Opposite the short boardwalk there is a group of mangroves planted and maintained by marine biologists from the University of Sydney. This sign commemorates the Glebe Society campaign to achieve public access to the foreshore. 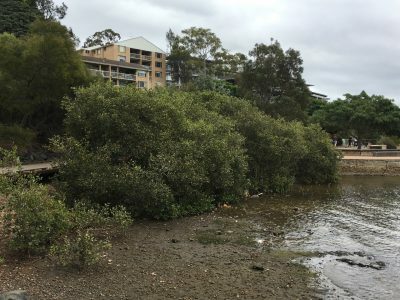 Opposite the short boardwalk there is a group of mangroves planted and maintained by marine biologists from the University of Sydney. Originally such mangroves were common along the shores of the bays. To your right at the top of the cliff, through the trees, are two original houses from the 1880s. Once these cliffs were lined with such houses, but many were demolished in the 1960s by developers who were keen to replace them with multi-storey flats. It was this destruction, often aided and abetted by local and state government, together with the threat of mass demolitions to create expressways for cars, that led to the formation of the Glebe Society. At that period there was no protection either for rare or historic buildings or for historic streetscapes or suburbs, and many were lost or degraded throughout Sydney. Many resident groups were founded about this time.